Simulating   Distributions What is   ? How are   ’s measured? What does the standard model predict? Simulating   distributions. Constraining the. 2 What is   ? 6 What Does the Standard Model Predict? 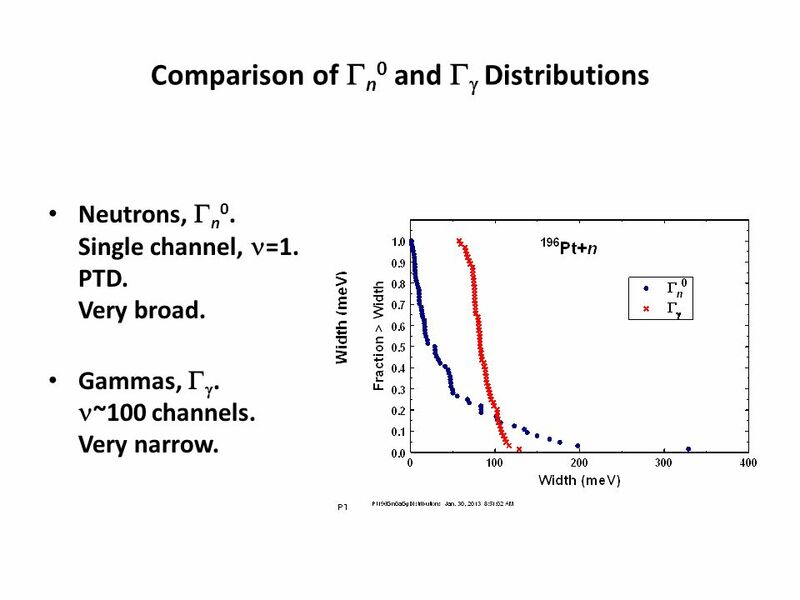 7 Comparison of  n 0 and   Distributions Neutrons,  n 0. Single channel, =1. PTD. Very broad. Gammas,  . ~100 channels. Very narrow. 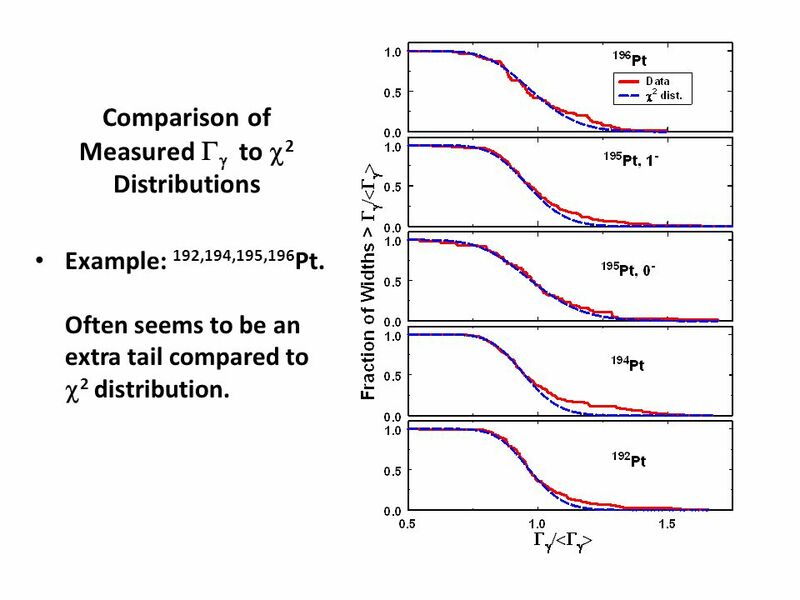 8 Comparison of Measured   to  2 Distributions Example: 192,194,195,196 Pt. Often seems to be an extra tail compared to  2 distribution. 10 Simulating   Distributions: Step 2 Calculating the   i ’s E  i = S n – E xi. Calculate f X1 (E  i )’s. 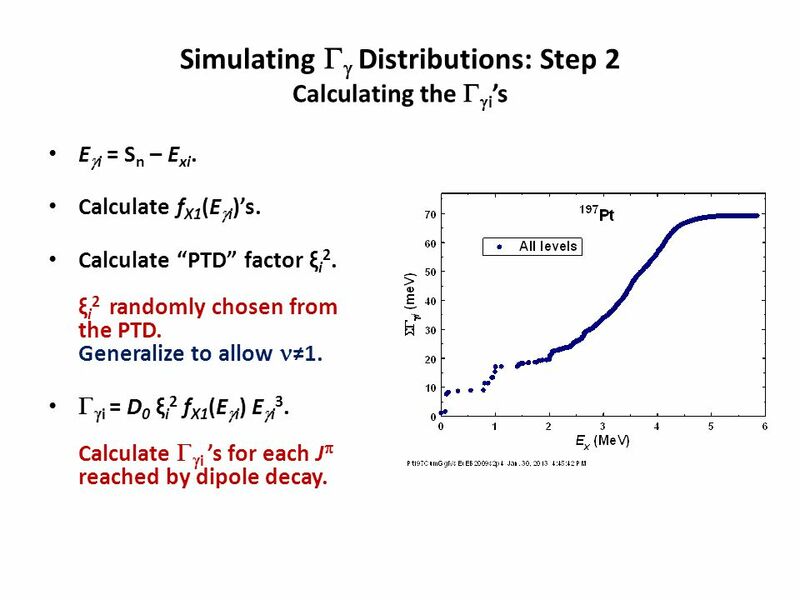 Calculate “PTD” factor ξ i 2. ξ i 2 randomly chosen from the PTD. Generalize to allow ≠1.   i = D 0 ξ i 2 f X1 (E  i ) E  i 3. 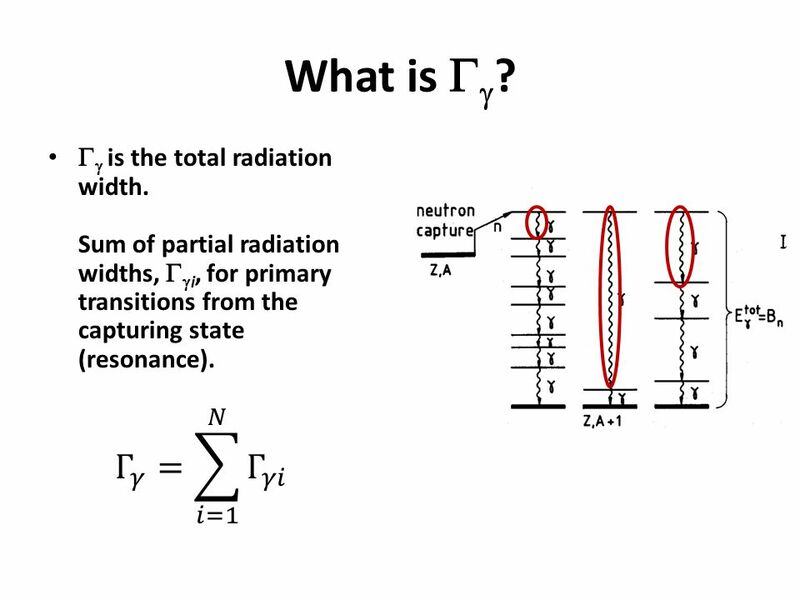 Calculate   i ’s for each J  reached by dipole decay. 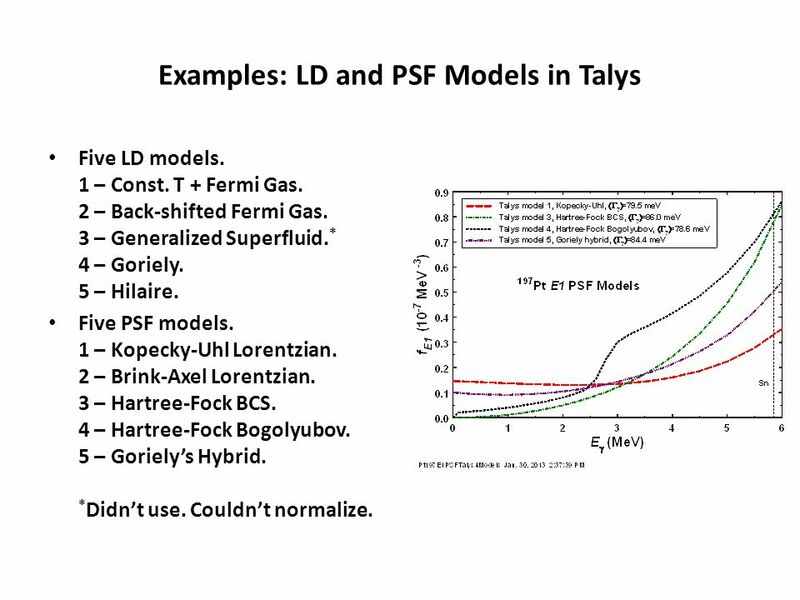 12 Examples: LD and PSF Models in Talys Five LD models. 1 – Const. T + Fermi Gas. 2 – Back-shifted Fermi Gas. 3 – Generalized Superfluid. * 4 – Goriely. 5 – Hilaire. Five PSF models. 1 – Kopecky-Uhl Lorentzian. 2 – Brink-Axel Lorentzian. 3 – Hartree-Fock BCS. 4 – Hartree-Fock Bogolyubov. 5 – Goriely’s Hybrid. * Didn’t use. Couldn’t normalize. 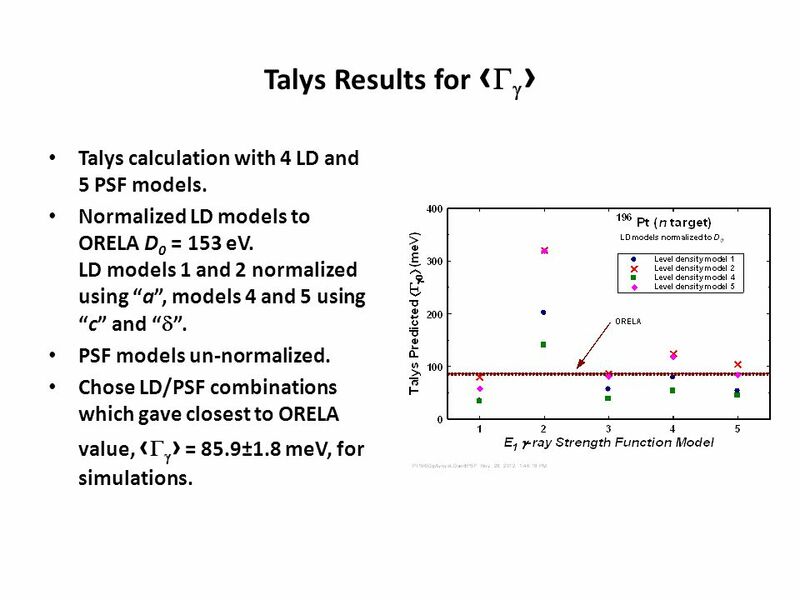 13 Talys Results for ‹   › Talys calculation with 4 LD and 5 PSF models. Normalized LD models to ORELA D 0 = 153 eV. LD models 1 and 2 normalized using “a”, models 4 and 5 using “c” and “  ”. PSF models un-normalized. Chose LD/PSF combinations which gave closest to ORELA value, ‹   › = 85.9±1.8 meV, for simulations. 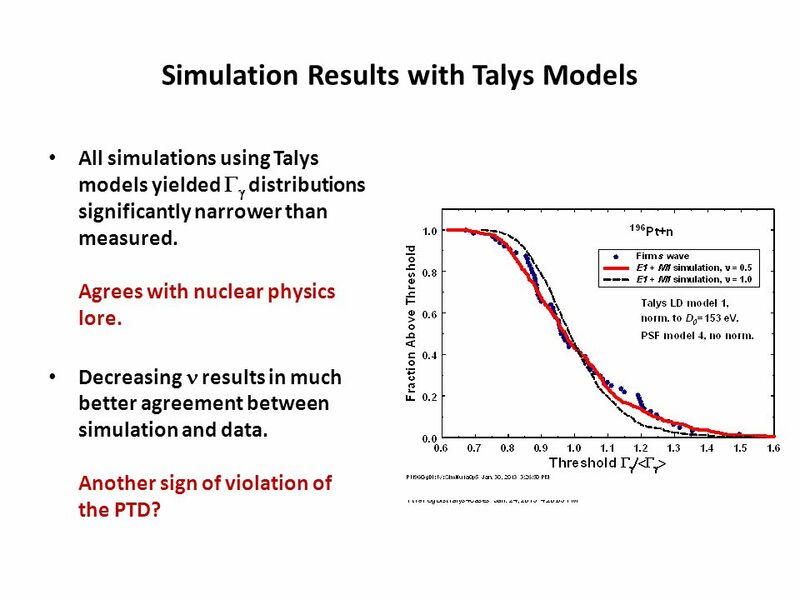 14 Simulation Results with Talys Models All simulations using Talys models yielded   distributions significantly narrower than measured. Agrees with nuclear physics lore. Decreasing results in much better agreement between simulation and data. Another sign of violation of the PTD? 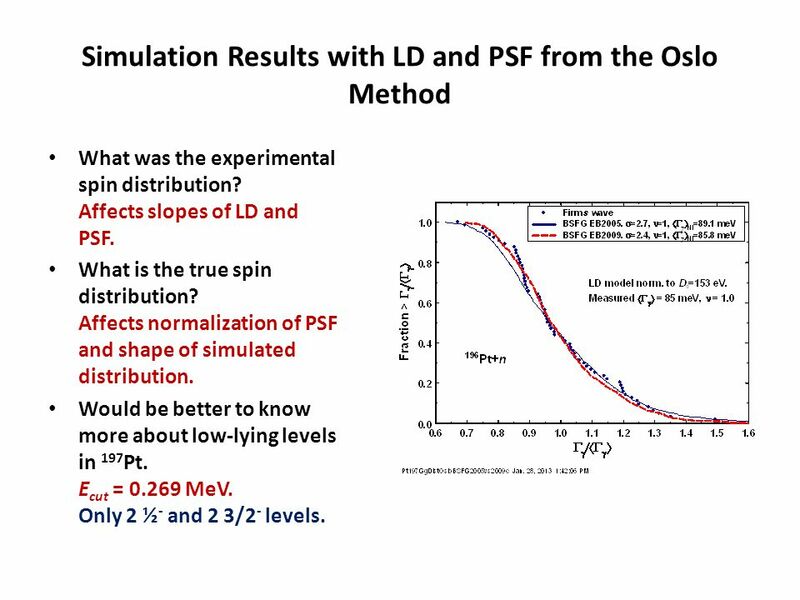 15 Simulation Results with LD and PSF from the Oslo Method What was the experimental spin distribution? Affects slopes of LD and PSF. What is the true spin distribution? 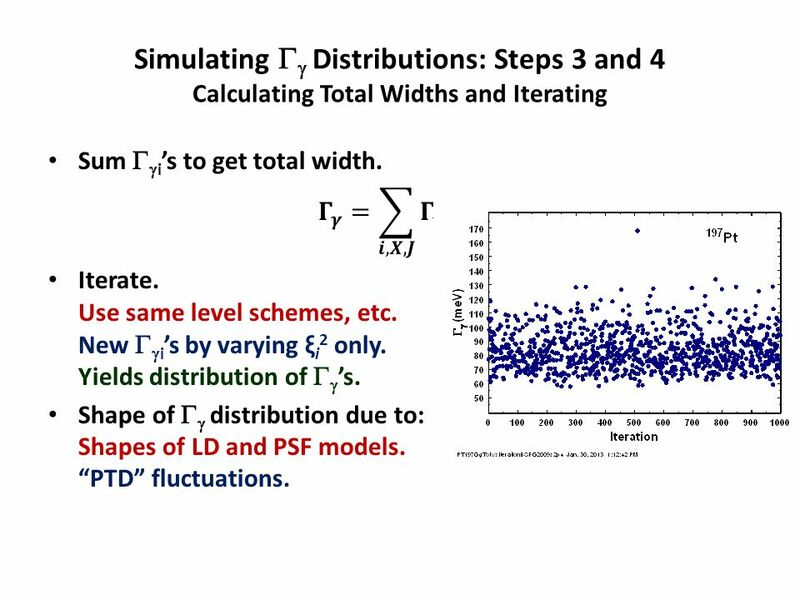 Affects normalization of PSF and shape of simulated distribution. Would be better to know more about low-lying levels in 197 Pt. E cut = 0.269 MeV. Only 2 ½ - and 2 3/2 - levels. 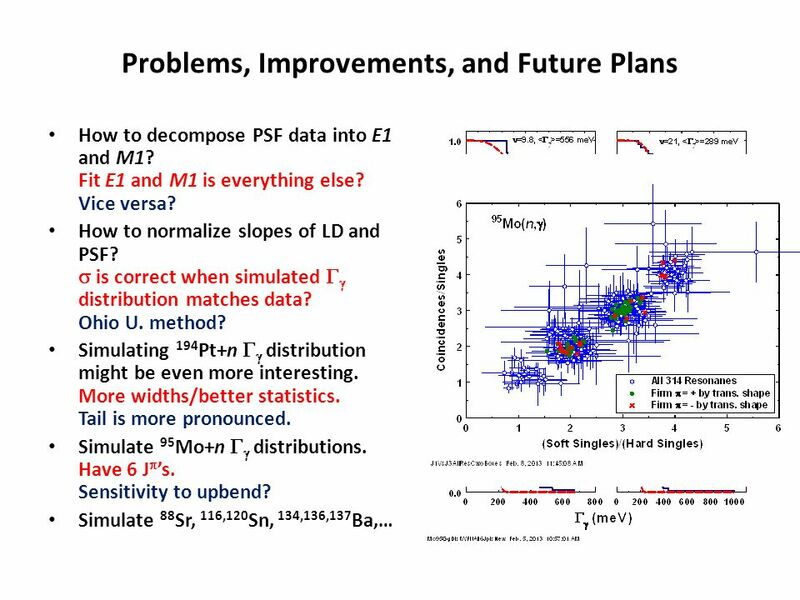 16 Problems, Improvements, and Future Plans How to decompose PSF data into E1 and M1? Fit E1 and M1 is everything else? Vice versa? How to normalize slopes of LD and PSF?  is correct when simulated   distribution matches data? Ohio U. method? Simulating 194 Pt+n   distribution might be even more interesting. More widths/better statistics. Tail is more pronounced. Simulate 95 Mo+n   distributions. Have 6 J  ’s. Sensitivity to upbend? Simulate 88 Sr, 116,120 Sn, 134,136,137 Ba,… Preliminary! 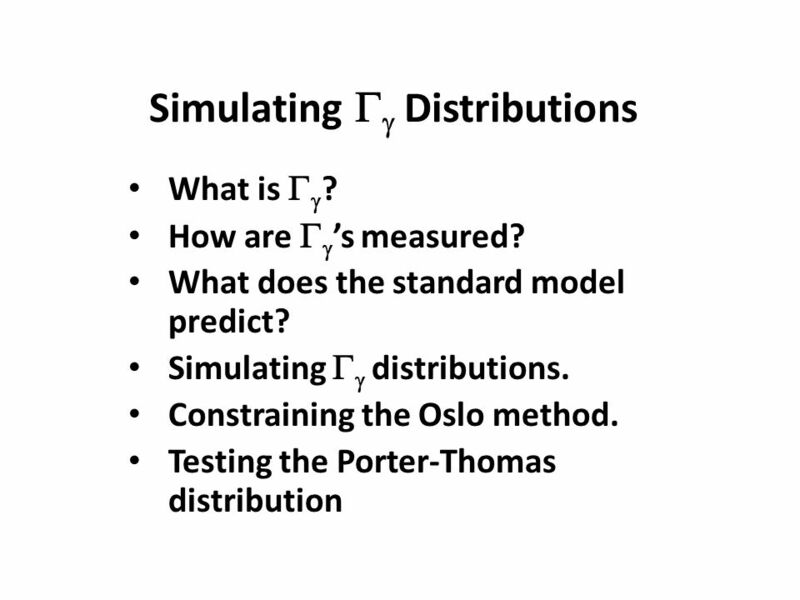 Download ppt "Simulating   Distributions What is   ? How are   ’s measured? 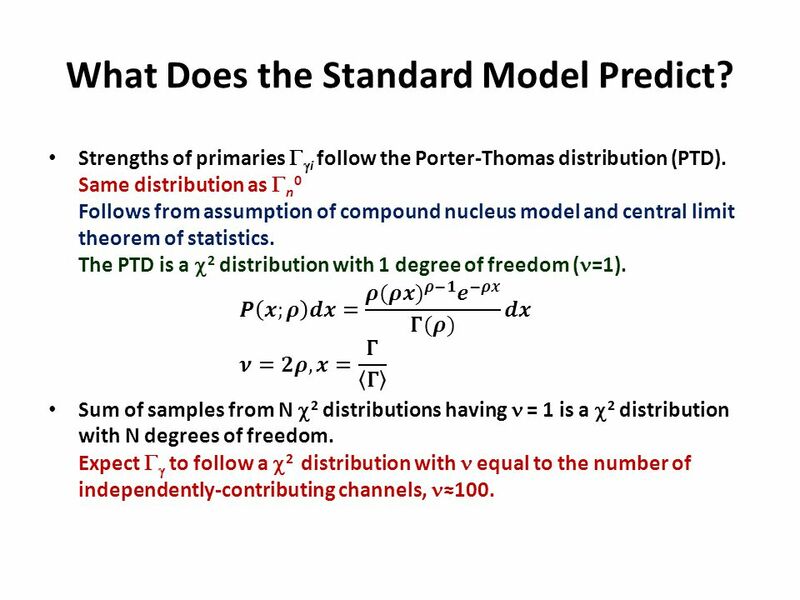 What does the standard model predict? Simulating   distributions. Constraining the." Presentation of the PhD thesis “Statistical properties in the quasi- continuum of atomic nuclei” Ann-Cecilie Larsen May 20, 2008 Ann-Cecilie Larsen May. Lorentzian-like models of E1 radiative strength functions V. A. Plujko, O. M. Gorbachenko, E. V. Kulich Taras Shevchenko National Kyiv University, Ukraine. n_TOF meeting November 2007, BARI. Biagio Di Micco17/07/ Radiative Phi Decays Meeting 1  Status of the work Biagio Di Micco Università degli Studi di Roma 3. Experimental Status of Deuteron F L Structure Function and Extractions of the Deuteron and Non-Singlet Moments Ibrahim H. Albayrak Hampton University. Modeling of Photonuclear Reactions & Transmutation of Long-lived Nuclear Waste in High Photon Fluxes M.-L. GIACRI-MAUBORGNE, D. RIDIKAS, J.-C.
N*(2007) observed at LNS Sendai H. Shimizu Laboratory of Nuclear Science Tohoku University Sendai NSTAR2007, Sep.5-8, 2007, Bonn 1670. Recent Electroweak Results from the Tevatron Weak Interactions and Neutrinos Workshop Delphi, Greece, 6-11 June, 2005 Dhiman Chakraborty Northern Illinois. Study of two pion channel from photoproduction on the deuteron Lewis Graham Proposal Phys 745 Class May 6, 2009. DeMille Group Dave DeMille, E. Altuntas, J. Ammon, S.B. Cahn, R. Paolino* Physics Department, Yale University *Physics Department, US Coast Guard Academy. 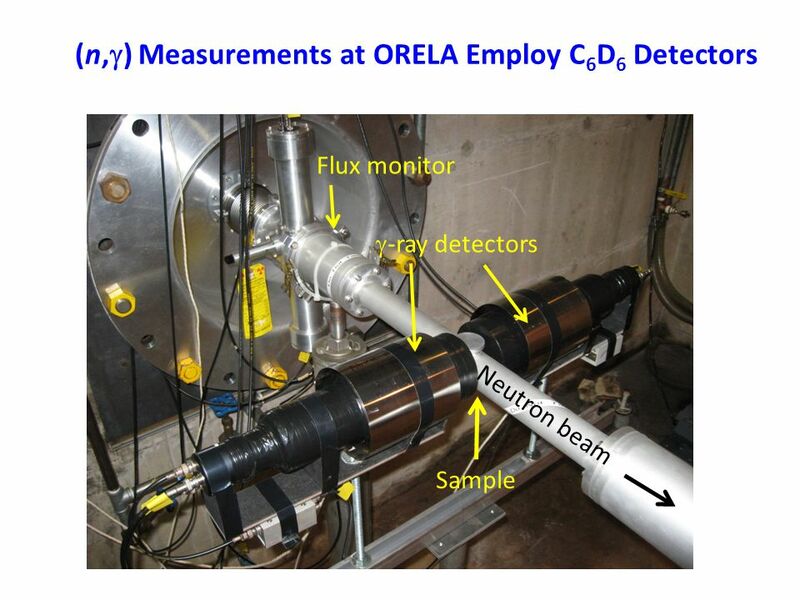 Precise neutron inelastic cross section measurements A.Negret 1 1 “Horia Hulubei” National Institute for Physics and Nuclear Engineering, Bucharest, ROMANIA. 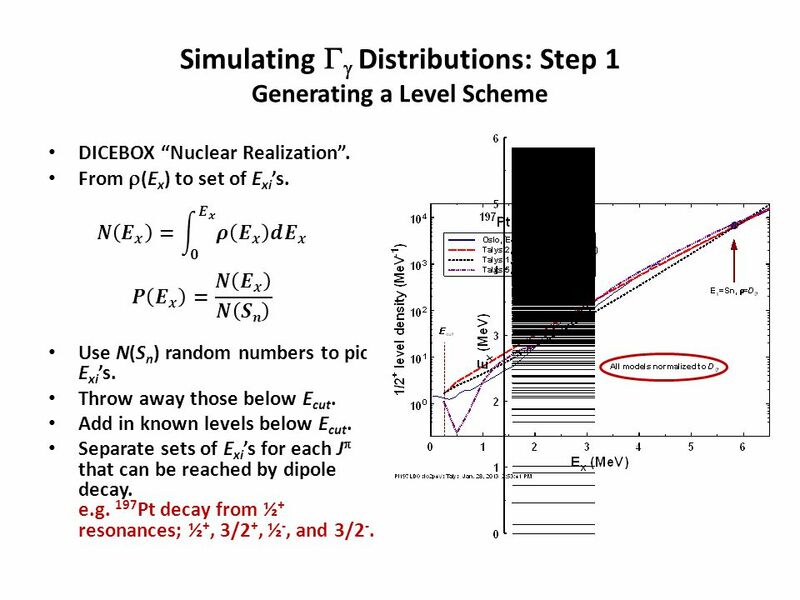 Joint IAEA-ICTP Workshop on Nuclear Reaction Data for Advanced Reactor Technologies Student’s presentation Calculation of correction factors for neutron. Workshop on Physics on Nuclei at Extremes, Tokyo Institute of Technology, Institute for Nuclear Research and Nuclear Energy Bulgarian Academy. 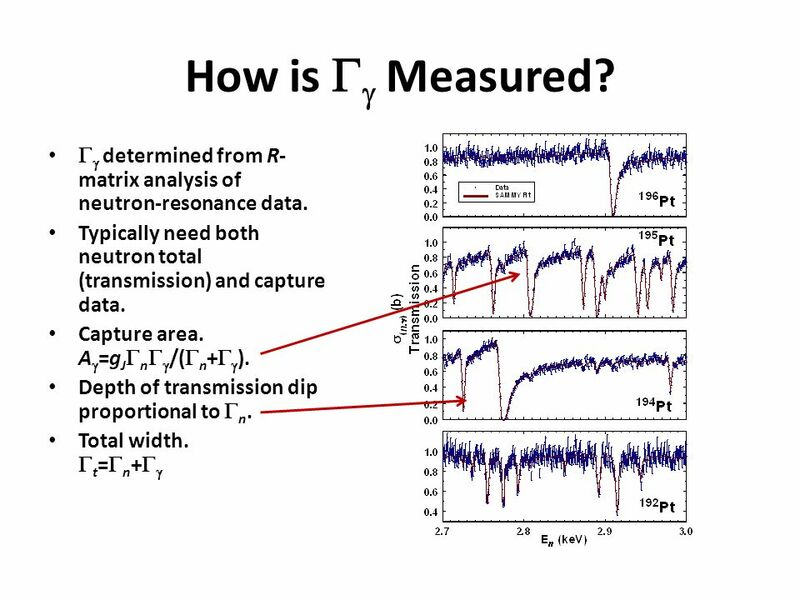 Experiment Rosen07: Measurement of R =  L /  T on Deuterium in the Nucleon Resonance Region. 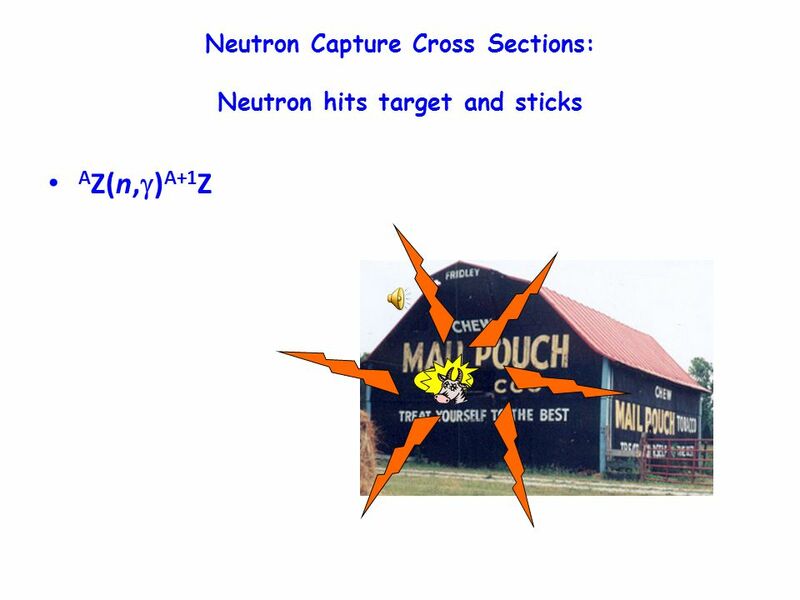 1  Physics  Data Analysis  Cross Section calculation.